I'm here to post our April Challenge winner! We want to say a big thank you to all of our participants this month. There were so many gorgeous cards entered! #9 which is Marilyn from One Stamping Fool. Our new challenge for May will be posted tomorrow! So check back. 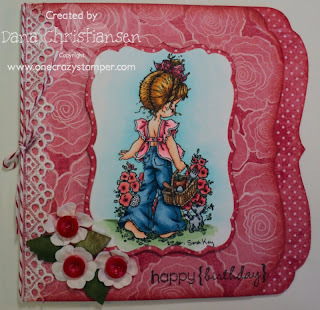 There is still time to enter our flower challenge at One Crazy Stamper Blog! 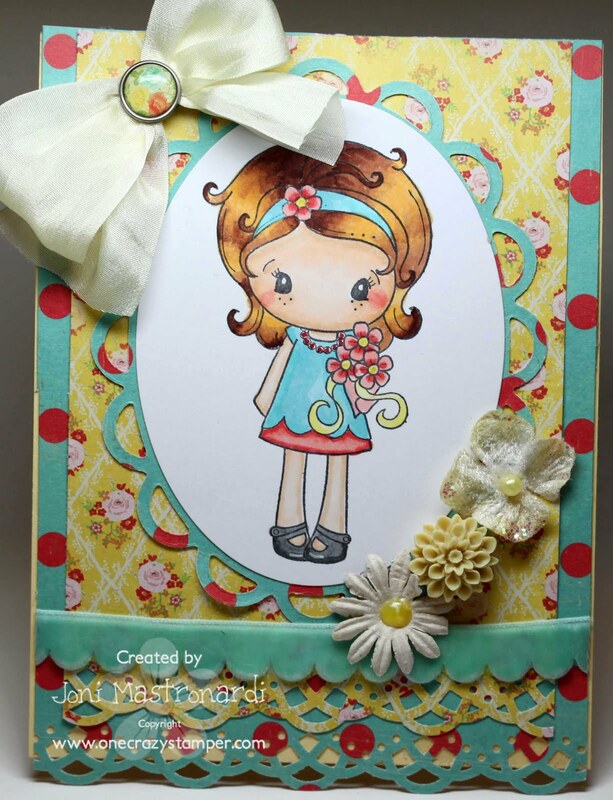 Today I have this adorable image: from CC Designs called Spring Kiki. It sure took a long time for spring to arrive, but I think it is finally here. I stamped Kiki with Memento Tuxedo Black ink onto Xpress It CS. 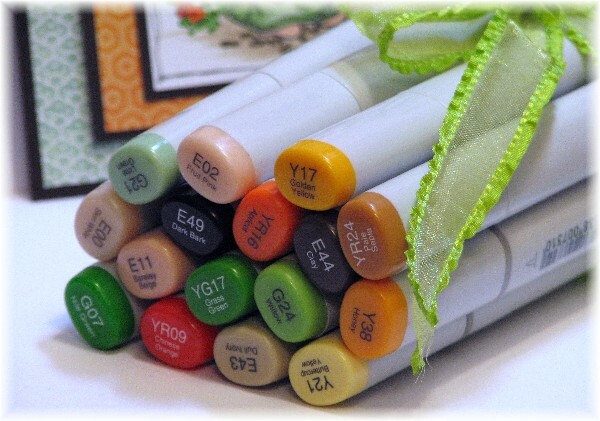 I colored my image with copics: E00, E000, E11, R02, R22, R24, E15, E18, YR21, BG32, BG34. I cut out my focal image with an oval nestie and layered onto a lacey oval nestie. I added a silk bow and flowers from my stash. 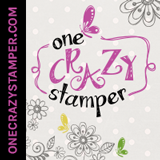 Check out all the new and awesome items at One Crazy Stamper! 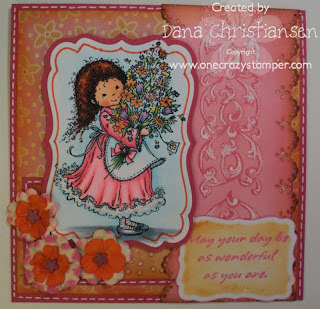 Thanks for stopping by today and remember to join our challenge over at the One Crazy Stamper Blog! Happy Thursday everyone! I hope you all had a wonderful Easter. 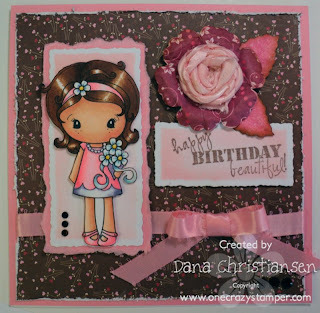 Paper: Basic Grey, Stampin’ Up! Hi, Madge here. 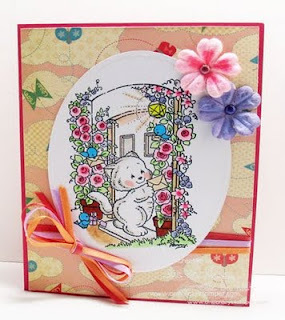 Today I’ve chosen to use a Whiff Of Joy stamp called Willow with Flower Basket. I love the simplicity, yet beauty of these stamps – and Lora, at ONE CRAZY STAMPER, has such a wonderful selection and fantastic prices to go with them. My friend Wendy, (thank you Wendy!) 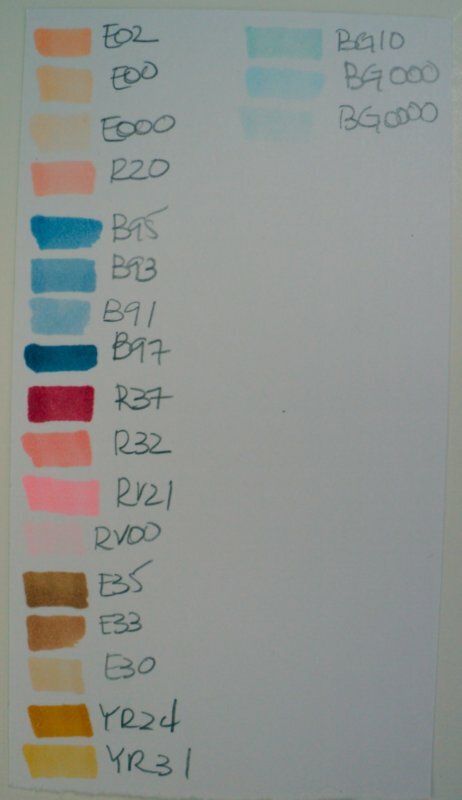 sent me this double-sided card Creatable – I chose to use copics to match the paper. I’m sorry, I did this card a week ago and have misplaced the list. 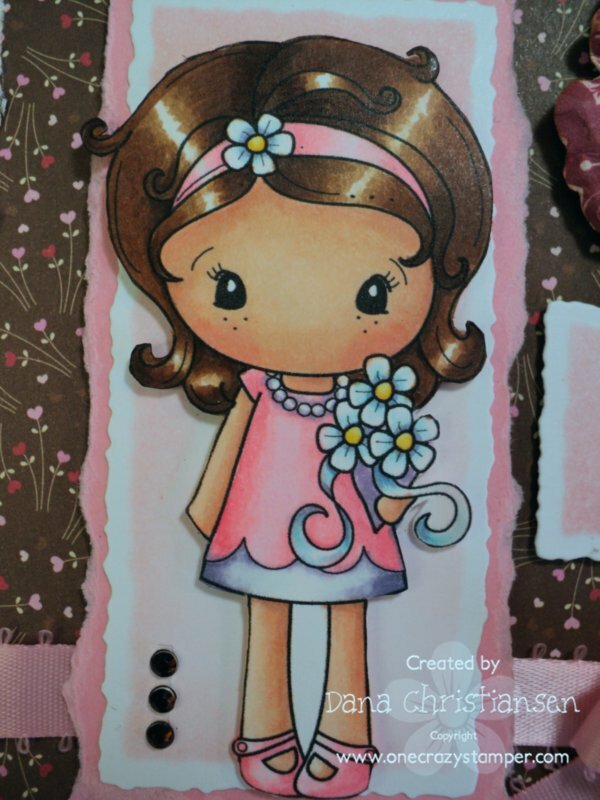 I used the following: Xpress-It Blending cardstock, Memento, Tuxedo Black ink, Copic Sketch Markers, Pearls , SU Lacey Border Punch, and miscellaneous cardstock and ribbon from stash. 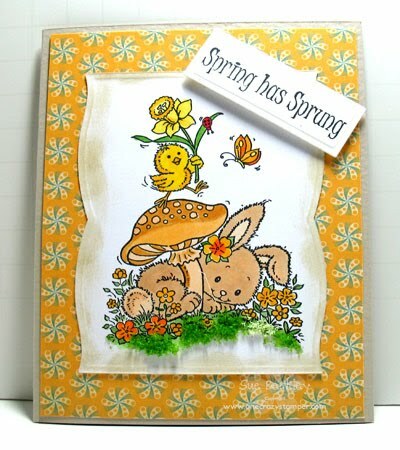 This is the last week to take part in the April “Flower” Challenge for the chance to win a very nice gift certificate to One Crazy Stamper. Someone will win, and it may as well be YOU. Can’t wait to see what you create!! This is your last week to enter our challenge for the month and your last week to have the chance to win a $25 gift certificate to One Crazy Stamper. Our theme for the whole month has been Flowers. My final card for the month is Rose's Garden by Sarah Kay for Stampavie. I used the flowers Lora carries here and then just added generic white buttons that I airbrushed with my copic R37. The shapes were cut with a Spellbinders Nestabilitie Die. Thanks for taking a look and I hope you'll head over to join our challenge! I've not had time to do this image from Flourishes' Beauty Within set up with glitter and acetate yet. It was worth the wait! I stamped the image with Stazon ink on acetate. On the reverse side of the image, I colored the acetate with the Copic Markers shown below. Next I ran the image through the Xyron machine and covered the back with silver glitter. I used Spellbinders Labels Thirteen dies to frame my image. 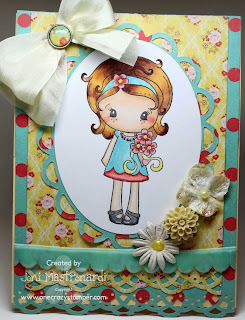 Just a reminder....the One Crazy Stamper challenge this month is flowers! If you have time, join us for the fun! 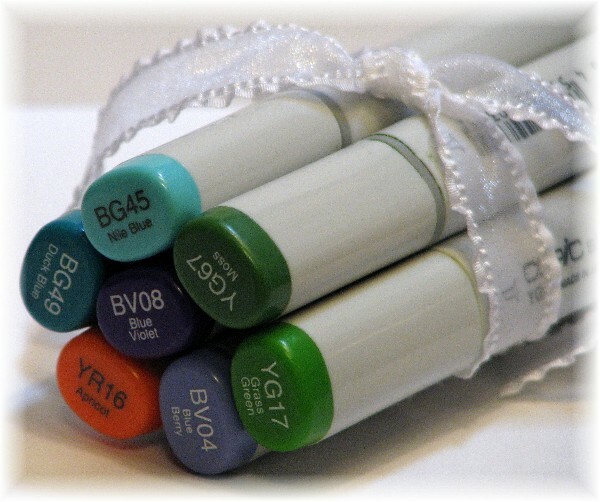 There is a generous gift certificate to One Crazy Stamper for a random participant. Good Luck!! 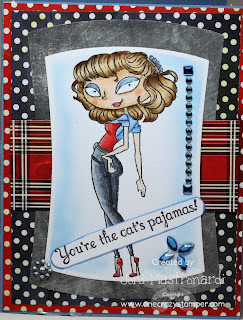 For my last post of the month, I used the very adorable Kitty Post stamp designed by Penny Johnson for Stampavie, which can be found at One Crazy stamper. There is still time to enter this month's challenge which is flowers for a chance to win a $25.00 Gift Certificate to Lora's store; One Crazy Stamper. 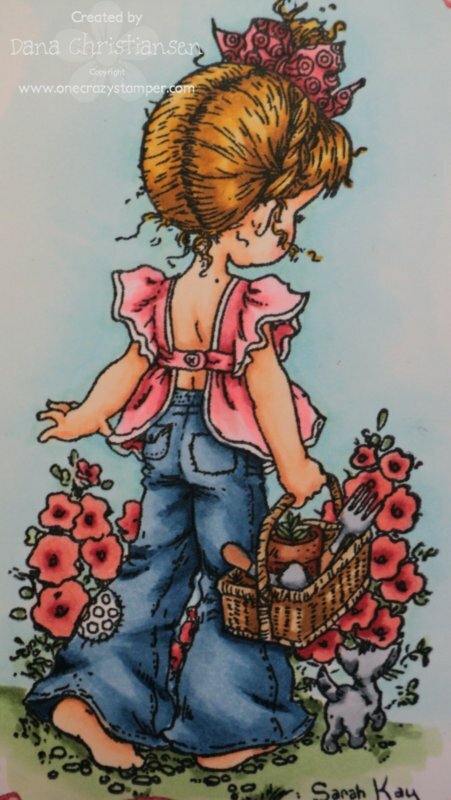 Today's card uses The Greeting Farm Fancy Anya. 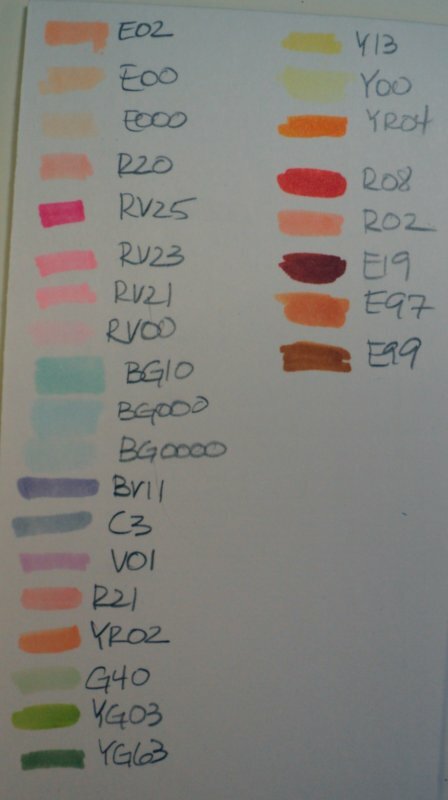 I used my wonderful copics (of course!). 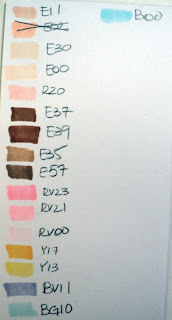 Also, I wanted to add a little tip for all you copic users! 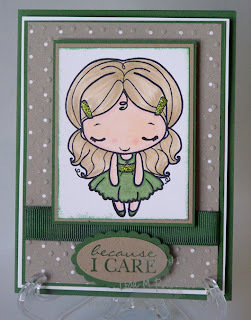 For this card I did not have the right color ribbon to match what I was doing so I used my green copic (the chisel side not the brush) and I colored in my white ribbon to match my card. Super easy and now any color ribbon you want is at your disposal! Today I have a new stamp from Kraftin Kimmie called Joanie. The spelling is a bit different than I spell my name, but I had to have this stamp. I stamped her with Memento Tuxedo Black ink onto Xpress It CS. I colored her with copics: E11, E00, E000, B21, B24, B26,N4, N6, N9, R02, R22, R24, E25, E31 and E50. I used a baby blue spica pen for her eyeshadow. I layered the focal image unto Reverse Wonky Rectangles. Dp is Basic Grey June Bug. I added a bit of bling from my stash and there you have it. Remember we are still having our Flower Challenge over at One Crazy Stamper. There is still time to join in the fun and WIN WIN WIN! 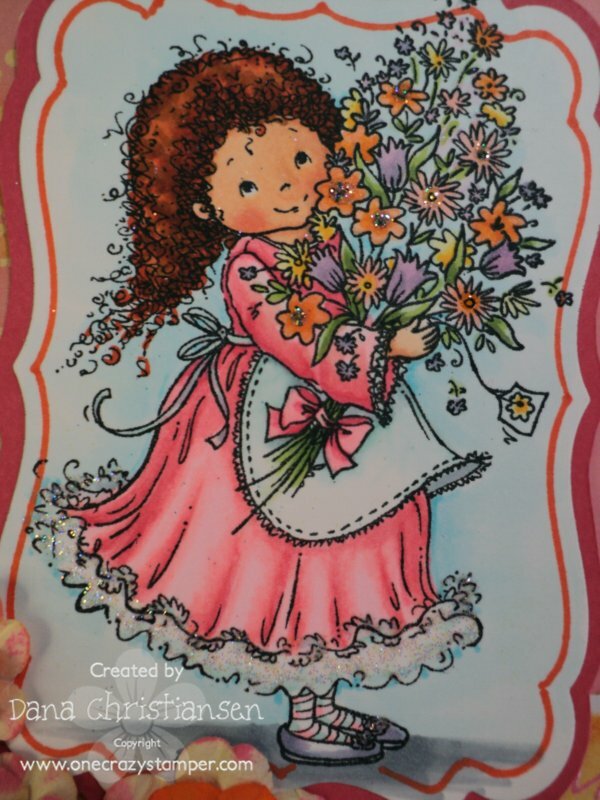 We still have our Flower challenge going on for the whole month of April at One Crazy Stamper. You could have a chance to win a $25 gift certificate to the store!! 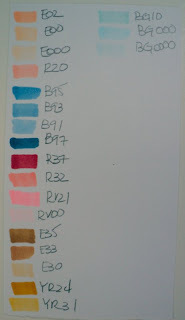 This week I've used Penelope by Sarah Kay for Stampavie. The flowers were made very simply with several layers of flowers. I used quite a bit of Tim Holtz Distress Inks on this in Vintage Photo and Spiced Marmalade. The shape was cut with Spellbinders Nestabilities. I'm sure hoping that Spring is Back! In celebration of that hope, I chose this adorable Stampavie image to showcase for One Crazy Stamper today! The challenge this month is flowers...bring on spring! Please consider joining the challenge! One lucky participant will win a generous gift certificate! I stamped my image with Memento Tuxedo Black ink and colored it with the Copic markers shown below. 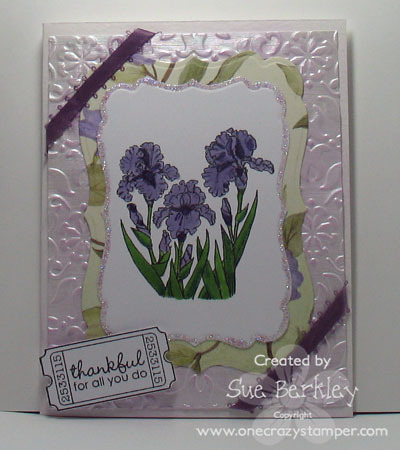 I used the My Mind's Eye True Blue 6x6 collection for my card. I love that though there is not a flower in the collection...I was able to make it flowery! 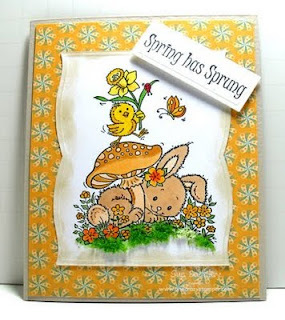 Hi, it is Sue here and for my post today, I have used Sweet Spring designed by Penny Johnson for Stampavie which are found at Lora's store OCS. Don't forget to enter this month's challenge before the end of the month for a chance to win a $25.00 Gift Certificate to Lora's store OCS. I am on a major Greeting Farm Kick!!!! I used Fleur Anya! She is sooooo pretty and was screaming to be colored Pink! Well if it is spring, can summer be far behind? I hope not. I would love to be sitting at the beach right now. So, I couldn't resist this new stamp set available at One Crazy Stamper. 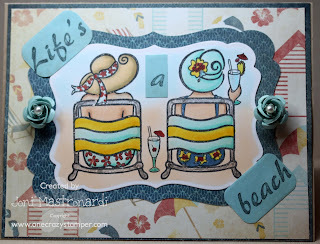 It is called Beach Plate 1 Stamps from Pink Cat Studio. 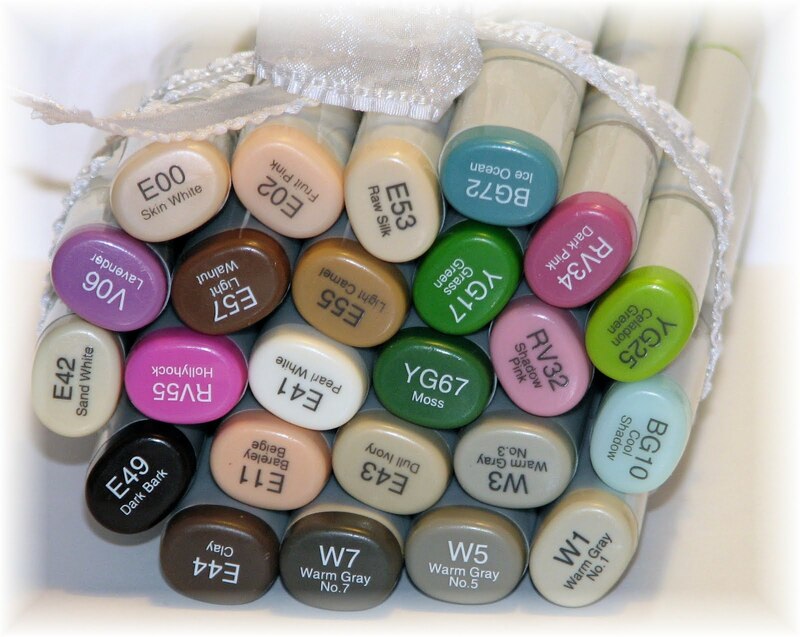 I colored the bathing beauties with copics (see picture below). and layered the focal image on a Spellbinders Labels 4 die. I airbrushed the background to look like sand and sky. DP is from Kaisercraft called Seaside. I added two flowered brads. Don't forget our challenge this month is flowers! Thanks for stopping by and check out all the new items at One Crazy Stamper! Ahhhh come on spring! I thought I would take advantage of the weather and snap a photo out in my garden. My plants are finally starting to peek through the ground. Yayyyy!!!! Paper: My Mind’s Eye; PaperTrey Ink; Stampin’ Up! Hi all, Madge here. I’m late posting today because I had a sticky situation with glue. First it wouldn’t dry – and then I knocked my finished card smack dab in the middle of it – face down! Do you ever feel like it is just not your day?? It wasn’t my night. I finally packed it in and started all over again this morning. This stamp is from a Flourishes stamp set called “Windows to the World”. 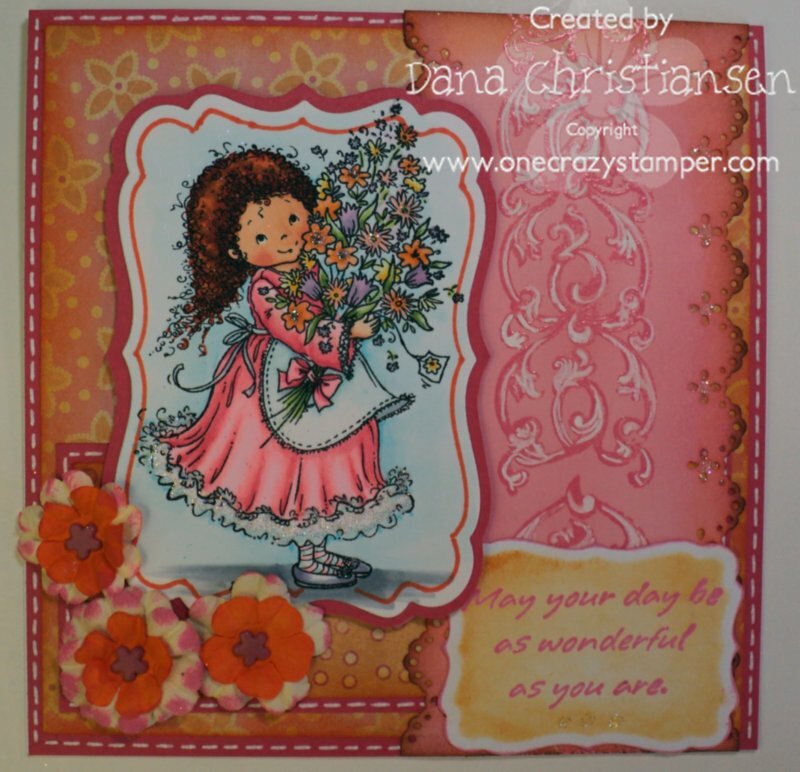 April is “flower” month at One Crazy Stamper – so I thought “flower soft” would fit in quite nicely. I chose to do a gate-fold card to keep the image in the focal point. The beauty of polymer stamps is the storage, seeing where your image is going to be stamped……….and flexibility!!! The “Wish you were here!” is in a straight line. I thought curving it to match the arch of the window would fit into the design better……. and yes, it did. Copics, Designer Paper, Xpress-It cardstock (especially for copics) Spellbinders Large Labels die, Flower Soft, Memento Ink, misc cardstock and distress inks. All available at One Crazy Stamper with prices that cannot be beat. I hope you’ve entered the April OCS challenge for a chance to win $$$. Can’t wait to see what you enter. Have you had a chance to make something for our awesome challenge this month?? And to think.. Jacilynn hardly knew me when she made our list of challenges almost 6 months ago.. lol!! I love, Love, LOVE flowers!!! I also love CC Designs Sugarplums so what could be more perfect?? I used papers from Bo' Bunny. Check out all the gorgeous papers Lora carries!! The sentiment is from the Amy R Sassy Sentiments set. 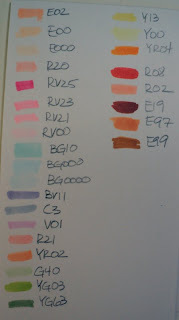 The only other accents (other than all my stash) are the rhinestones and distressing with Tim Holtz Distress Inks. I cannot wait to see what you come up with for this fun filled challenge!! Phew....today it was pretty warm here...unseasonably so...and with it we had some wicked weather. Thankfully all is well...and we're all happy to wait more patiently for the warmer temps...preferably without the *weather! * I chose to use this happy Stampavie image today called Bernadette Admiring the Spring Flowers. 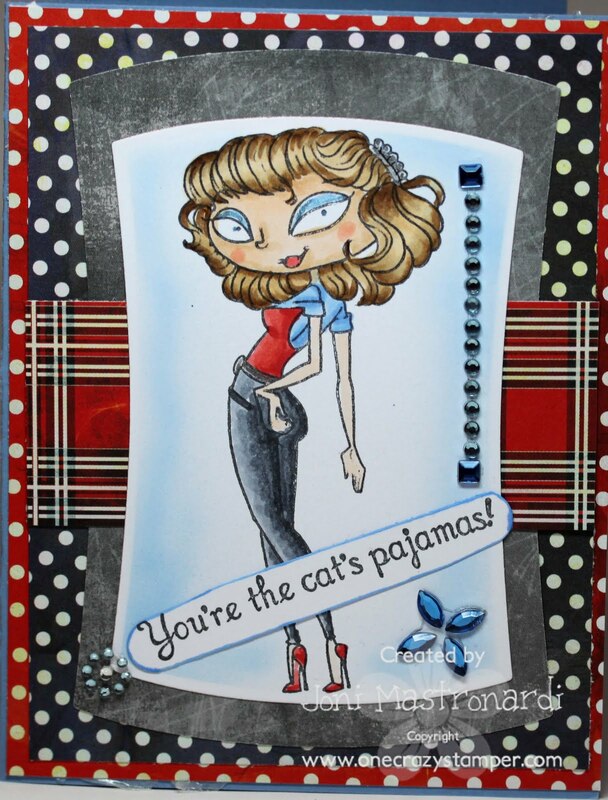 I stamped her with Memento Tuxedo Black ink and then colored her with the Copics in the photo below. 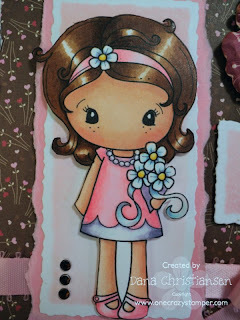 The designer papers I used were from the Tickled Pink 6x6 collection from My Mind's Eye. 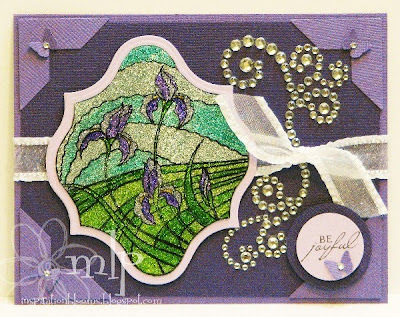 I used Spellbinders Labels Four dies and Fleur De Lis Accents for my card. The sentiment is by Hero Arts, flowers by Prima. We hope you can join us this month for our Flowery challenge! There is a generous gift certificate on the line for one lucky participant! May it be YOU! Good luck!! I do apologize for being late with my post. It has been a roller coaster of a week, but I am very thankful that grandchild #6 who decided to arrive nine weeks early is doing well. 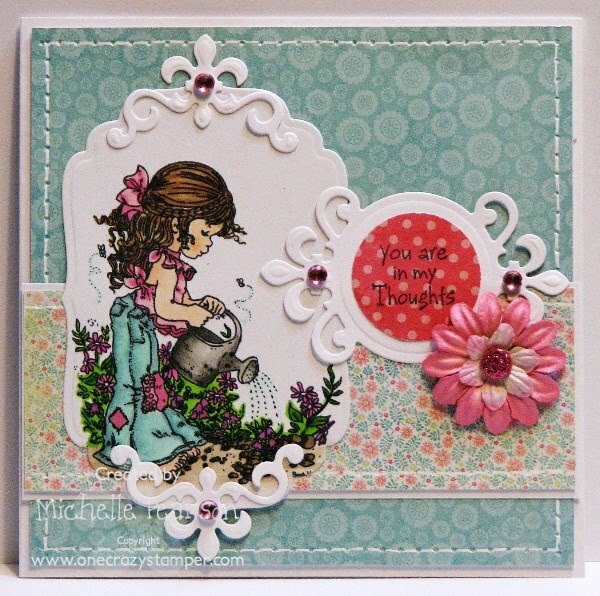 For my card today, I used the Iris from the Year of Flowers - Set 2 by Flourishes and the Ticket Sentiments from Whimsy Stamps. All supplies can be purchased from Lora's One Crazy Stamper and she certainly has some amazing prices. Do enter this month's challenge which is flowers for a chance to win a $25.00 Gift Certificate. Hi all! I have a super fun tutorial to show you today that shows you how to do a fun coloring project with your Cool Grey Copics! I used some of the new products from the store. You know how I LOVE The Greeting Farm stamps! This tutorial features Fancy Anya﻿. Hope you enjoyed this tutorial and I would love to see you use this tutorial. Leave me a link if you do so I can see your creations! 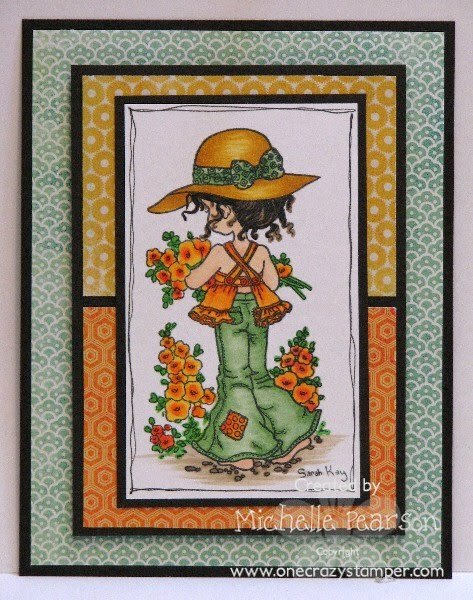 April Guest Designer Debb D.